A 21-year-old junior at Johns Hopkins is building computer models that mimic electrical activity in the heart, showing patterns that can have fatal consequences. When Alok Sathaye's models are perfected, they may help researchers who are studying abnormal rhythms in the heart and looking for ways to prevent this dangerous condition. Sathaye, whose work was supported by an undergraduate research grant from the university, is a 1998 graduate of Governor Livingston High School in Berkeley Heights, N.J. Early last year, he asked Leslie Tung, an associate professor of biomedical engineering, about research opportunities in Tung's Cardiac Bioelectric Systems Laboratory. 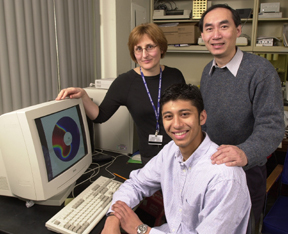 Because Sathaye had a strong background in computer programming, Tung invited him to work on digital models that demonstrate how waves of electricity move though cardiac cells, causing the heart to beat. Emilia Entcheva, a postdoctoral fellow in the lab, provided additional support for the project. "I knew a lot about programming," Sathaye said, "but she helped me with the biology and the mathematics behind this type of computer modeling." "Computer models are an important and valuable complement to experiments on living cardiac cells," said Tung, who sponsored Sathaye's grant application. "They can also allow us to study the underlying electrical behavior in much greater detail than we can do with living cells." A reliable computer model enables scientists to easily see what happens when electrical activity in the heart is stimulated or disrupted. As part of his project, Sathaye has created animated sequences that show some electrical problems that can occur in a layer of cardiac cells. "If you have scar tissue from a heart attack, the electrical propagation of the heart changes," he said. "Instead of having an electrical wave go through the heart as it normally does, the wave circulates around the area of dead cells and can enter into a pattern of self-sustained, erratic activity." This abnormal rhythm can lead to cardiac arrest, he said. Alok Sathaye creates computer models of electrical activity in the heart under the supervision of Leslie Tung, right, an associate biomedical engineering professor, and postdoctoral fellow Emilia Entcheva. Having completed his computer model of cardiac activity, Sathaye is now comparing his simulation results against tests conducted earlier in the Tung lab with engineered networks of living cells. "A computer model that can't be verified isn't very useful," he said. The Johns Hopkins junior, who is majoring in biomedical engineering and computer engineering, hopes to submit his work to a scholarly journal by the end of 2001. "This has been a real growth experience for me," he said. 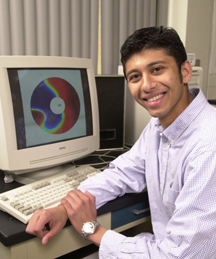 As one of 43 Johns Hopkins students who received a Provost's Undergraduate Research Award in the 2000-2001 academic year, Sathaye will present an overview of his project during upcoming awards ceremony. The event will take place 3 to 6 p.m. on Thursday, April 5, in the Mattin Center on the Homewood campus, 3400 N. Charles St., in Baltimore.